I presented a paper at the Seeing Silence: Interdisciplinary perspectives symposium today. My paper was titled: Seeing Silence as Cinema. In August 2016, in Korea, I had presented a paper on Silence at the International Association for Mission Studies. At that time, Silence the film had not been released, so my paper in Korea was somewhat limited, drawing mainly on Silence the book. With Silence released in New Zealand in February, my paper today was a deeper engagement with the movie as cinema. My argument was that movies are a visual discipline, so we need to “see” Silence. I used a number of scenes from the movie, including the capture scene, to argue that movies allow us to pray with our eyes wide open. This was based on the quote from Martin Scorcese – “I made it as a prayer, an act of worship. I wanted to be a priest. My whole life has been movies and religion. That’s it. Nothing else” (A Matrix of Meanings: finding God in pop culture : 155). Another key resource was Lloyd Baugh, Imaging the Divine: Jesus and Christ-Figures in Film and his types of “Jesus: the movie star” movies. 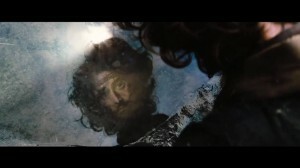 So for example, the capture scene is a fusing of three types: Christ figure, historical Jesus and Jesus art. As a result, Scorsese is changing the fundamental stance of the viewer, from watcher to immersed participant in the reality of God in silence. My paper was one of six papers at the symposium. The six papers, accepted after peer review, fell elegantly in three pairs – historical, religious and cinematic – and ensured a very rich conversation. We also gained permission from Fuller Studio to show a interview with Silence director, Martin Scorsese, which added a further rich layer. The audience was a mix of lay and academic, which definitely enhanced the conversation. The event was part of the Christianity and Cultures in Asia series, a joint venture sponsored by Knox Centre for Ministry and Leadership, the Otago University Department of Theology and Religion, and Presbyterian Research Centre. Each partner brings distinct resources and ensured a thoroughly worthwhile conversation about how to live faith faithfully.